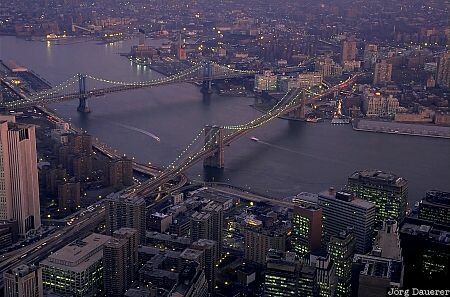 The illuminated Manhattan Bridge and Brooklyn Bridge after sunset seen from World Trade Center. Both bridges cross the East River to connect Manhattan and Brooklyn. Manhattan is in New York City, New York on the east coast of the United States. This photo was taken in the evening of a sunny day in August of 1995. This photo is part of the exhibition Bridges (February 2019).